Part one of this three-part review covers the 00 Gundam in all its glory, read on for a full review! Upon completing this kit and starting to take pics, it became clear it was far too much for a single post, so I’ve decided to first focus on the 00, then the 0-Raiser support unit, finishing with a look at how they combine to create the 00 Raiser and the extra weapons included with this final form. Ok, for anyone not following the series, 00 is introduced early in series 2 as a replacement for Gundam Exia, which ends it’s service suitably battered. Side by side, 00 looks much chunkier, but with sleeker and more refined parts at the same time. 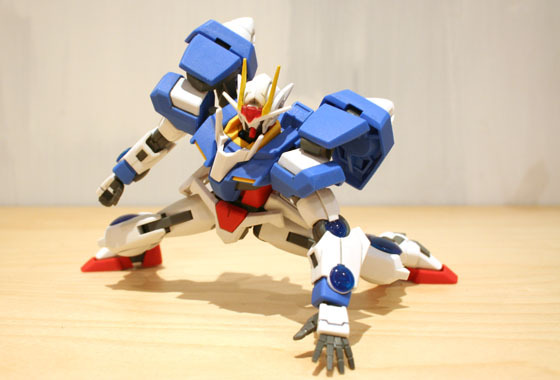 I always though Exia looked a big gangly so i’m glad they addressed that. It also reduces the size of the shoulders and adds some vertical fins to the head. 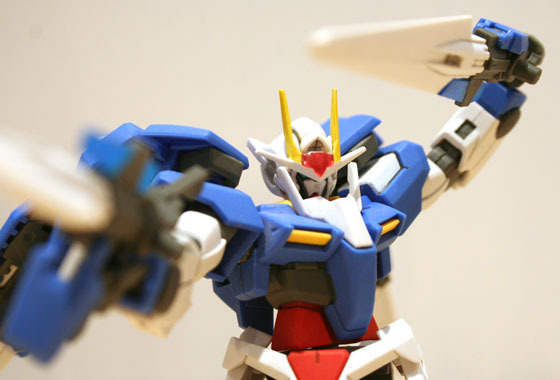 The rear view reveals a much simpler beam saber rack on the 00, and also dumps the sabers mounted on the shoulders. A larger backpack with jets replaces the GN drive on the back – this unit now has 2 drives which are mounted on swivel units behind the shoulders. 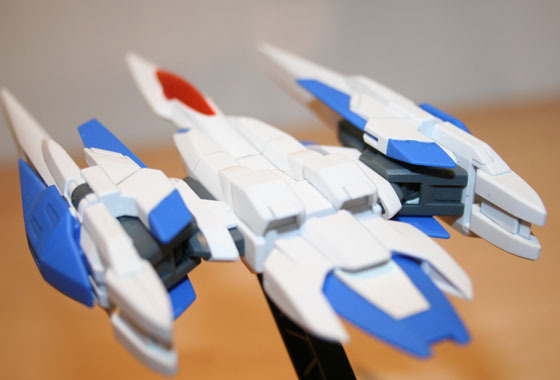 The 00 is a very sleek design, so there weren’t really that many panel lines to add extra detail. i’ve painted a few bits to add extra detail – the shoulders for instance should be all blue but i’ve copied the 00 Qant design to include a bit of white on there. The head probably required the most work – the vertical fins needed painting, as did the red central part. Also the grey area surrounding the ‘mask’ had to be painted in. I stupidly topcoated this kit with the clear GN condenser parts in, and proceeded to ruin them trying to clean it off… so to fix my mistake i’ve painted them clear blue – which I actually really like the look of! This is by far the department in which the 00 is a big winner! Articulation is nothing short of amazing, but it does make the kit a bit unstable at times, especially compared to my last kit – the Murasame which was solid as a rock! From the hips-down the legs can actually twist in a full 360 degrees, and the arms also provide a similar level of movement, but are a little loose from the elbow joint down. 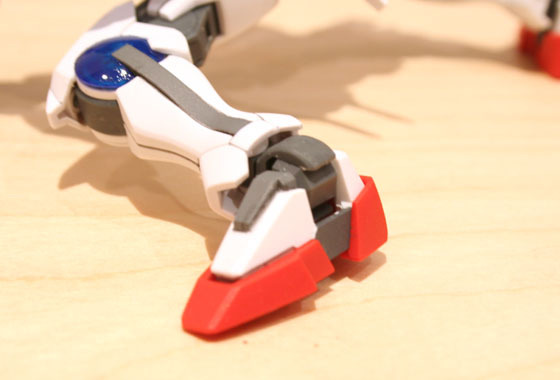 The ankle joint is unlike any i’ve seen in a previous kit, connecting the polycap lengthways and giving it space either side to allow the leg to move in a 180 degree arc of movement, insane! Not only are the armaments plentiful, but they are very versatile too, with most having more than one mode / use. 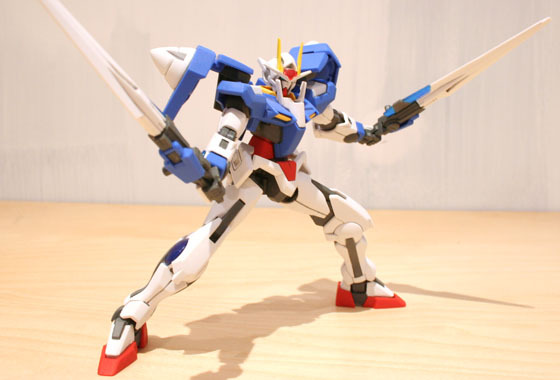 2x GN Sword II – these can switch between gun and sword mode. When not in use they connect to the side skirts. These can also connect together at the hilt to create a massive twin blade / staff. GN Shield – composed of 2 parts which connect together to form the shield. Can also mount onto the GN verniers or either forearm for Katar-style weaponry! The white-blade cn slides in and out for pointless gimmick fun. 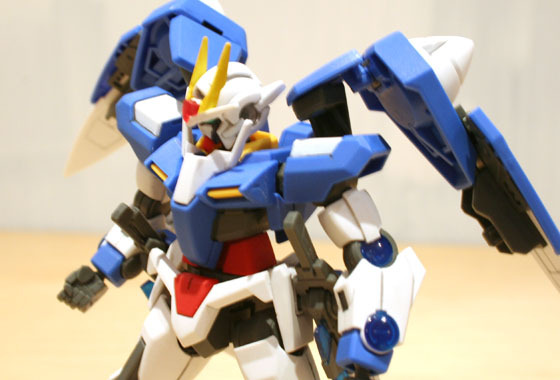 Well the 00 has certainly grown on me during this build, it had enviable poasability and a sleek look to it. The lack of stability is a bit of a shame but adding putty inside the body would probably fix that. Next up will be a look at the 00 support unit, the 0-Raiser! Here are a few more pics of 00 in the meantime, enjoy! total cool fella, love the double pistol shot as well. 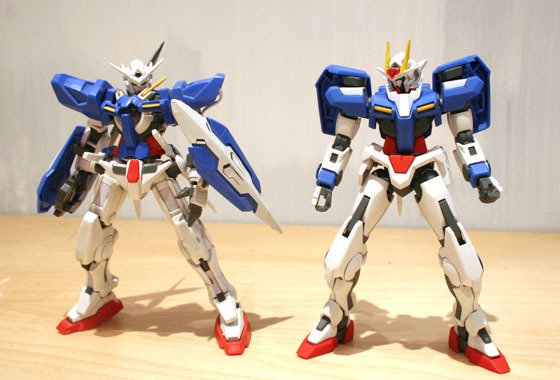 its nice to see it next to exia for a proper comparison. dont think i can top your build there , it looks solid! Cheers Rich! Despite a couple of hiccups it’s come out pretty well – so happy I managed to fix that big messup with the condenser parts. I’ve yet to see any of your builds so I think you’re just being modest! I bought the 1/100 version of this bad boy from HLJ – what a kit. The light up GN drives are smart, as are the GN swords. I’ll be ordering the 1/100 Raiser to go with it soon. I kicked myself because I see they released a MG 1/100 00-Raiser kit, combining both. Still the 1/100 is good to look at. Very nice! I was really torn between the 1/144 and 1/100 when I picked mine up, then my available funds made the decision for me 🙂 you got any shots of the kit online? 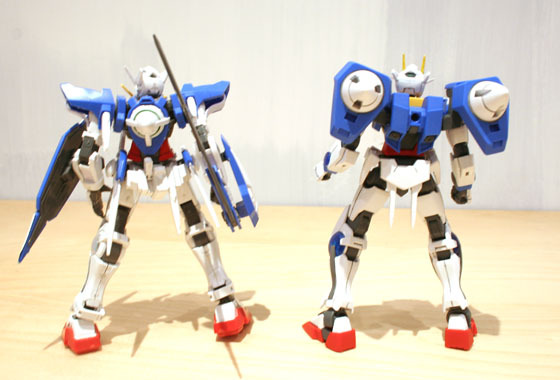 I just got the 00 Gundam 1/144 and I am liking how you painted the shoulders white/blue. Since the part is blue, did you prime it then paint or did you do a few coats of white? Hey, Jason! To paint the shoulders I masked them off with marking tape(yellow Tamiya stuff) then applied a couple of coats of regular paint as you said – never tried priming as my painting attempts are usually a disaster! I’ve ruined my HG Build Strike and am trying to fix it at the moment.